In this post we mention the steps for the issuance of the passport or maritime booklet to be able to work on board of a vessel. To be able to obtain the passport or the maritime booklet it is neccesary to be in possession of the Basic Security Training certificate, and for this reason you should do a course of 10 days. If you once finished the Basic Training in Maritime Safety you should wait between 2 and 5 working days to be able to process both the certificate of the course in Maritime Captaincy and the issuance of the Passport or Maritime Record. A standard request, completed and signed by the interested party, or who represents him/her. A passport-sized photo, with name and surname written in pencil on the back, head should be uncovered and without dark glasses. Payment in a bank of the current rate, relative to the issue of the Maritime Pass or Passport, model 790, rate code 094. Certified photocopy of the certificate of the Basic Training Course in Maritime Safety. You must present the original and a photocopy, so that you can be certified there. 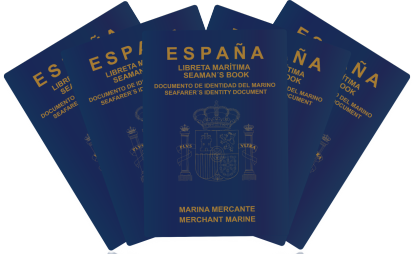 NOTICE: If any of you is a foreigner, you will not be able to issue the maritime passport or the booklet in Spain, you will have to do it in your country. But do not worry, in Captaincy you can ask for embarkation and disembarkation sheets, which will be a provisional document that insures you during embarkation and disembarkation, until obtaining the passport in your country. I hope this post has helped you. We will tell you more on how to do paperwork in the Maritime Captaincy in our blog.